Ann Coulter was born 55 years ago, today, on 12/8/1961. 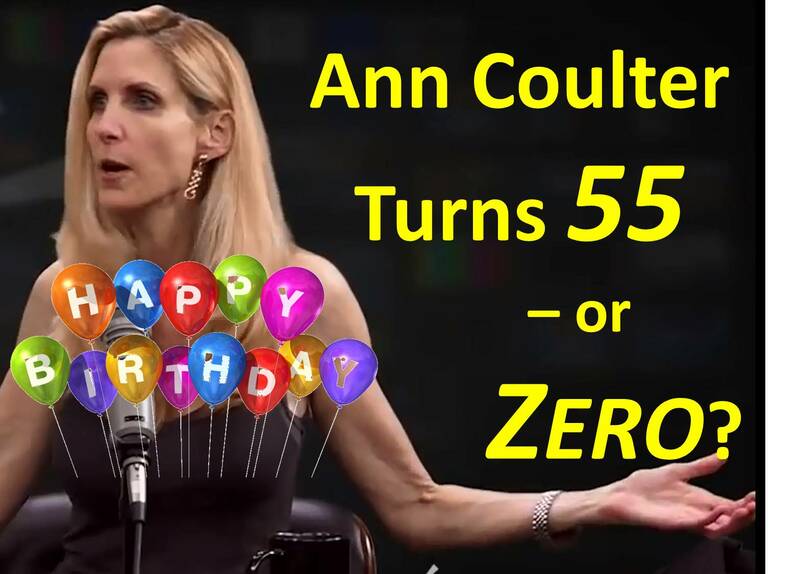 Coulter’s spiritual birth date is as yet undetermined. Chronologically, Ann is 55-years-old; spiritually, she may not even be a newborn. Coulter received a strict Catholic education (K-8) at St. Aloysius Catholic School until she entered public school. She eventually rejected her father’s Catholicism in favor of her mother’s Presbyterian faith, yet, upon reaching adulthood, she apparently disengaged herself from religion altogether. The absence of an internal moral compass would forever plague her. With the publication of Godless (2006), Coulter zealously expressed a newfound faith in God, one which was conveniently finely calibrated to her ideology, agenda, and career. Her father passed away in 2008, after years of declining health from dementia. Her mother died the following year. Since then, Coulter’s religious and political views have become quite bizarre, suggesting that her religious beliefs – whatever they were as a child and young adult – were actually those of her parents but not something she herself truly believed. Coulter has never been restrained by an internal moral compass. Rather, when she toed the line it was to please her parents, not God. With their passing, Coulter has liberated herself from all moral and religious constraints. For a “Christian,” Coulter spends an ungodly amount of time attacking Christians for behaving like Christians. Moreover, Coulter’s own version of the gospel is decidedly different from that of traditional and historic Christianity. 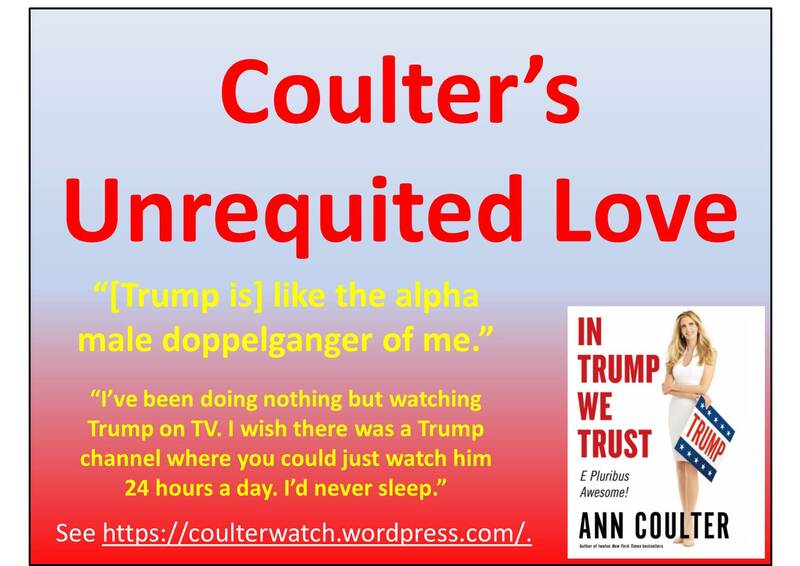 Coulter defends Trump on virtually everything, irrespective of the truth, belying her claim, “I want to speak the truth.” But then, truth has never been a high priority for Coulter. Is that how Coulter views evangelicals? Coulter, again, eschews character and godliness to further her political and ideological agenda. She relegates integrity to the margins and places expediency front-and-center. In doing so, Coulter demonstrates her own faithlessness to not only the principles and doctrines of her faith but to her professed faith itself. Coulter boasts of being a Christian, yet doesn’t act like one. Are we to believe her claims or our eyes? Love. 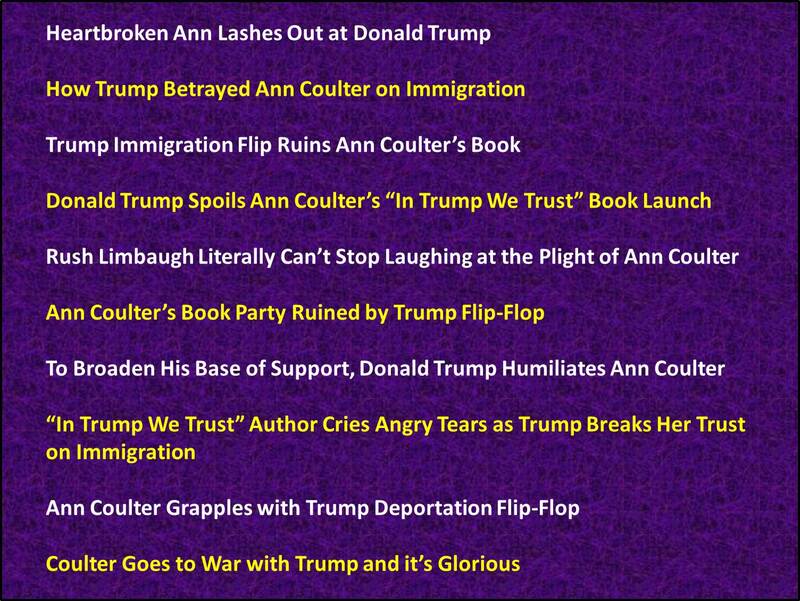 If Coulter loves anything, she loves to hate. A master of polemics, vitriol is her passion. Sarcasm – cutting – is her favorite form of humor. Joy. 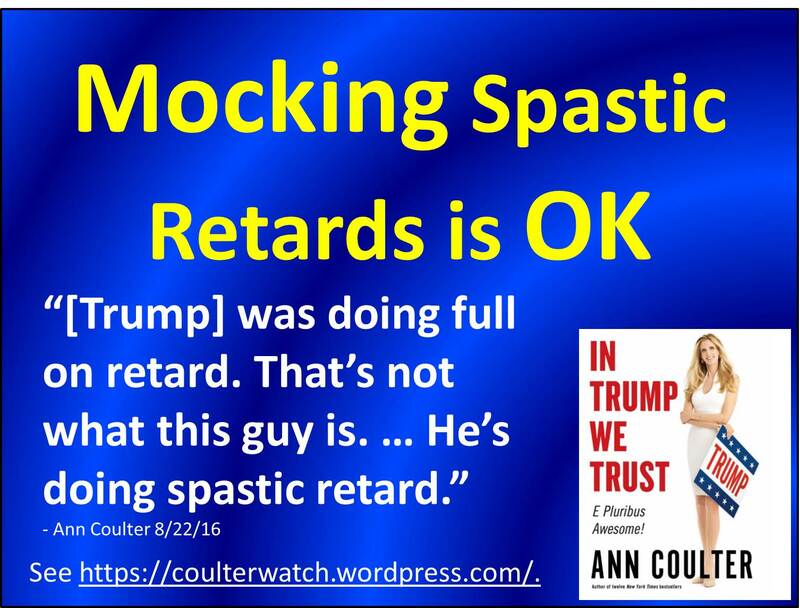 Coulter appears most joyful when she is in the spotlight (narcissist seeking glory) and when she is emasculating her foes (and they are legion). Longsuffering. The very moment someone steps out of line, Coulter instantly launches into a Twitter tirade. Those tirades are frequent and they are often ugly. Kindness. 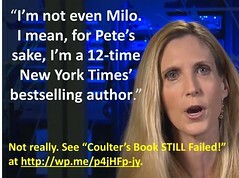 Coulter is not particularly well known for her kindness. Indeed, Coulter lacks simple charity. Goodness. If anti-Semitism, anti-Catholicism, and nativism count as “goodness,” then Coulter is filled to the brim. Faithfulness. Coulter is renowned for betraying her friends, her clients, her readers, and voters in both local and national elections. Similarly, Coulter betrays the very people of God, attacking their godliness, calling them traitors, and facilitating their martyrdom. 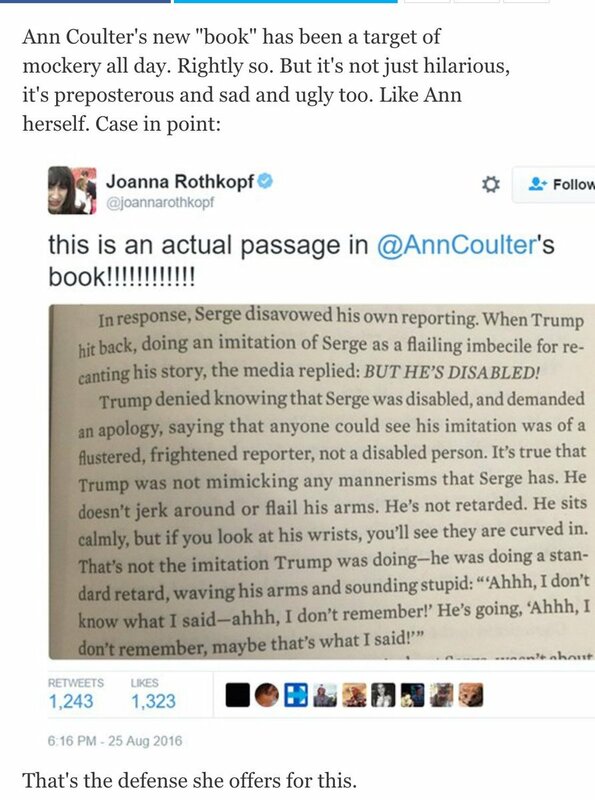 What has Ann actually accomplished with all of her nonsense? How many lives has she damaged or destroyed? How much damage has Ann done to herself and to those she loves? Coulter sees herself – and more importantly, wants to be regarded – as “an extraordinarily good Christian.” But worldly people are incapable of living a godly life. The fruit of the Spirit is the fruit of the Spirit. The worldly cannot behave in a godly manner. We expect Coulter to act her age – and she does: 55 (chronologically) and zero (spiritually). May Jesus touch Ann’s heart this Christmas season and fill her with His love, joy, and peace. 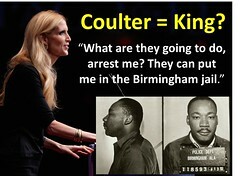 See The Gospel According to Ann Coulter, available as a free download at www.coulterwatch.com/gospel.pdf. 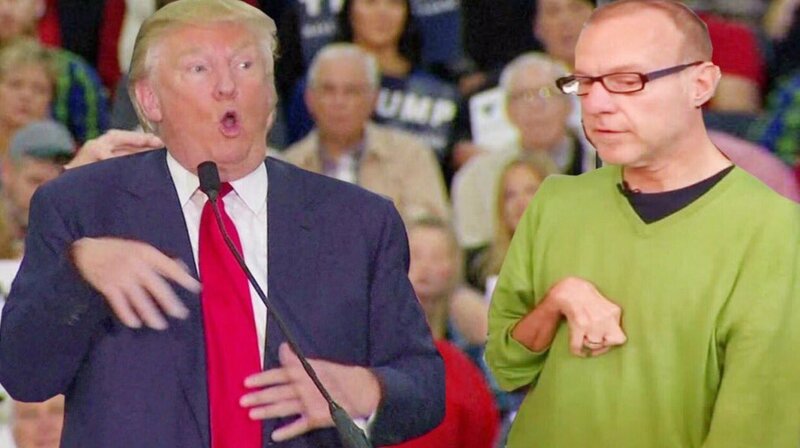 Ann Coulter, “The Meek Shall Inherit the Earth, but They Shouldn’t be President,” 10/28/15. Free book: Vanity: Ann Coulter’s Quest for Glory explores the narcissism and hubris which besets Coulter and her savior, Donald Trump. 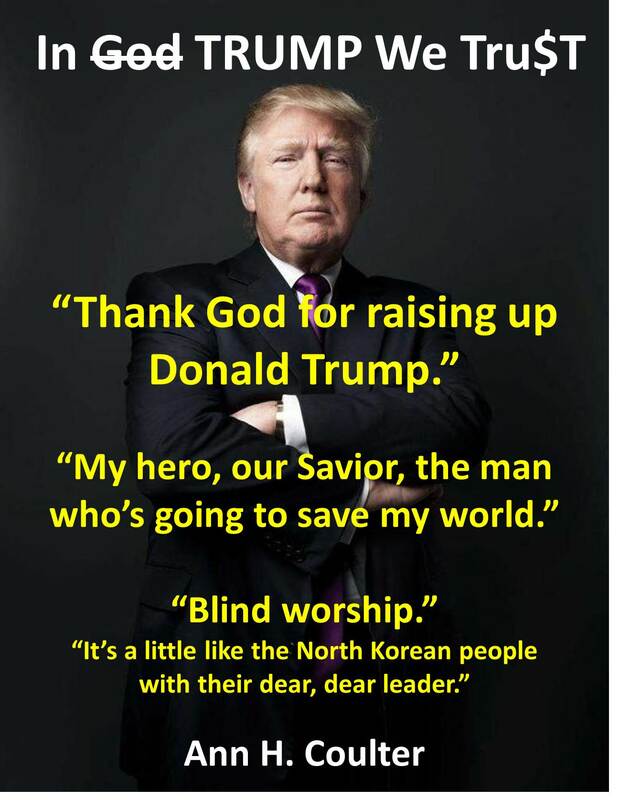 Both profess a desire to save America but each seeks their own glory. Hubris demands the fulfillment of personal ambition regardless of the consequences to America. What is the impetus for this self-serving pride and how does it become so potent, yet, ultimately, impotent? 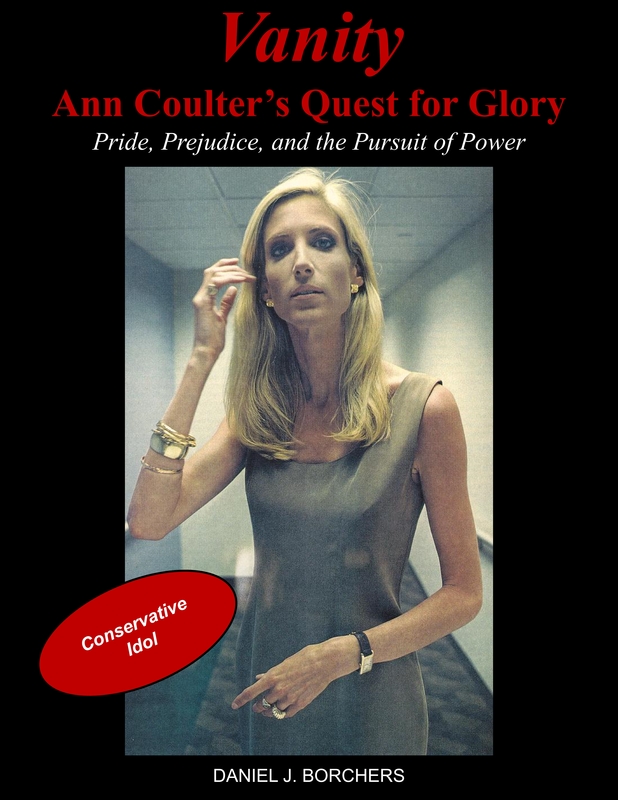 Highlights from Vanity: Ann Coulter’s Quest for Glory can be found here. The entire book is available as a free download here. Why? Because Trump is coarse enough and boorish enough to withstand the media onslaught against him. In her mind, his tasteless ego is like the protective scales of a dragon. Whoa! Seriously? Trump’s positions change on a daily, if not hourly, basis. In her book, Coulter claims, “Trump is like a Shakespearean ‘fool’: he seems crass because he speaks the truth.” Even Coulter has admitted that Trump is a fraud and “mental,” so one wonders why she would lie so spectacularly. Here are a few possibilities: 1) Coulter is used to being a propagandist; 2) Coulter is selling herself and her books; 3) Coulter has staked her reputation and career on a Trump victory; and 4) Coulter views herself and Trump as only saviors of America. 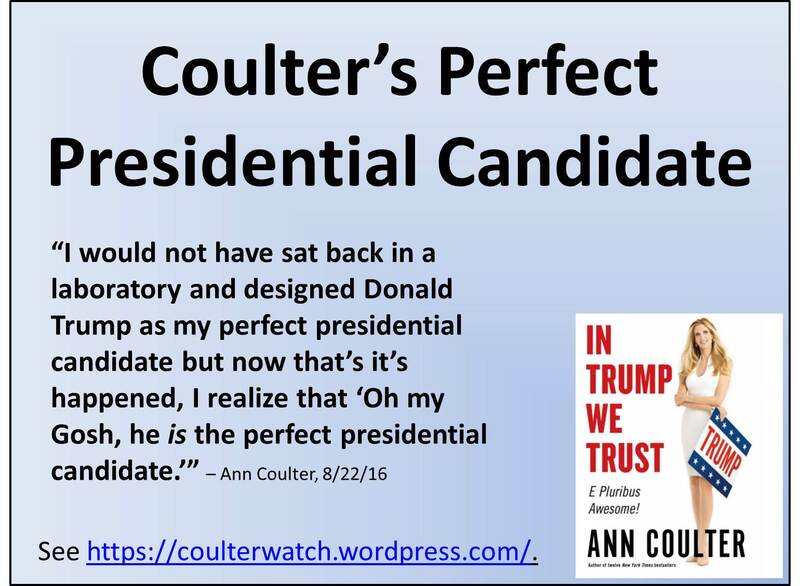 Regardless of the reasons for Coulter’s subterfuge, her “perfect candidate” is the worst possible option of Republicans, for constitutional conservatism, and for America. Of all the GOP candidates, Trump is the only one who could actually lose to Hillary. Coulter’s latest RINO will ensure that Democrats win the White House (and Congress?) this November.